Join Leopold on his incredibly short adventure on the lovely island of Peanut Wharf. Made for MAGS, July 2015. Charming game. Loved the rolling bubble cat. Short and sweet. The gen1 gameboy style and good animations make it worthy of a tea break quickie. Graphics and sound were beyond excellent. Only gripe, is that I wish I could've sped up the dialog at some points, and not have the mouse go back to center at end of dialog, because while trying to click to speed it up, I ended up accidentally clicking again on a dialog option. A very short and sweet game with beautiful art, I especially liked the Gameboy-like visuals and nice animation, the 16-bit sound effects also added a lot. Beautiful game! 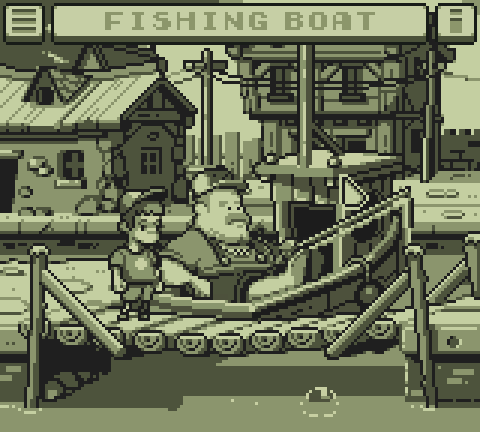 The retro GB visuals and sound are like brain-candy :) and topped off with some lovely animations. A nice little game, you should try.